Many organizations offer drop-ins for things like open-gym, or to allow for a pay as you go type of situation. Another alternative is to sell punch cards, or class passes, where the fee for all visits is paid up front. The passes are 'punched' each time the student takes a class and the number of prepaid classes depletes with each visit. Jackrabbit can help you to sell and track these types of enrollment options! A drop-in is a one time occurrence. There is no tracking necessary, it is used the same day it is purchased. 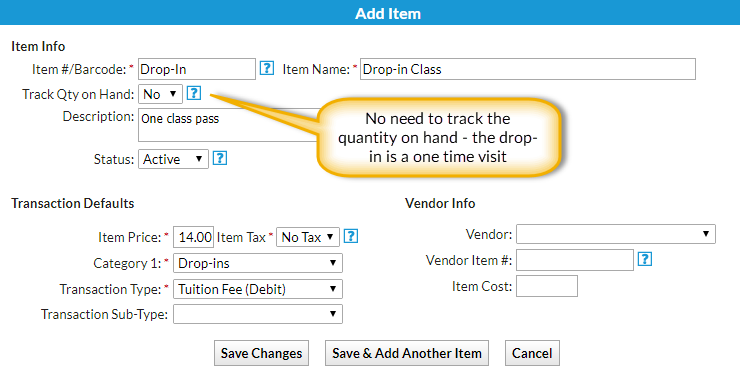 The Jackrabbit Store can be used to sell the drop-in by setting it up as a store item with the price for an individual class. When someone drops in, that item is selected in Make Sale/Post Fees and the sale is recorded. The person is not enrolled into a class. If they have an account with you already, their 'attendance' can be seen by looking at the transaction history for the family. When someone wants to drop-in you will go to the Store and select Make Sale to sell the item. If the student dropping in is already registered with you and has an account in your database, you can use the Store/Family Search field on the Make Sale page to pull up the family's account. The drop-in will then be recorded in their transaction history. Punch cards, also called class passes, are a great way to offer discounted rates to students who don't regularly attend classes with you. Typically sold in groups of 10 or 20, the price per class is lower than if a student were to drop-in that many times. With these passes, it is crucial that you track the usage and ensure that the card is not used beyond the number of classes it was issued for. To sell a punch card you'll go to the Store menu and select Make Sale to sell the card. Instead of just posting the sale to the store account, you'll want to select the specific family who is purchasing the card. If the student is new to you, set them up with a family record before making the sale. It is always good to keep track of these punch cards by asking the purchaser to fill out a card and sign. 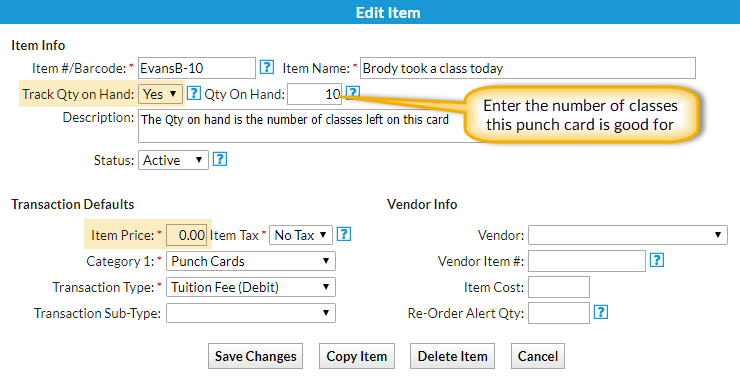 This card helps you create their punch card account and will remind you of what was purchased if you are too busy to look it up right away. For every punch card sold to a family or student you will create a unique store item to track each use of every family's card(s). You can use the family name as the item barcode and name, or you could create barcodes on the cards issued and then create the items using those unique barcode ids. Note: This item is unique to the family and should not be used for any other sale. Because you will want to keep track of how many punches have been used you will set the item to track the quantity on hand. The unique item will not have a price, it is strictly used to track usage. The generic item (10 Class Punch Card or 20 Class Punch Card for example) was used to charge the family for the card. When the student takes a class you will use the Store to 'sell' them their unique item. This will reduce the number of classes left on the card and record their 'attendance' in the family's transactions history. 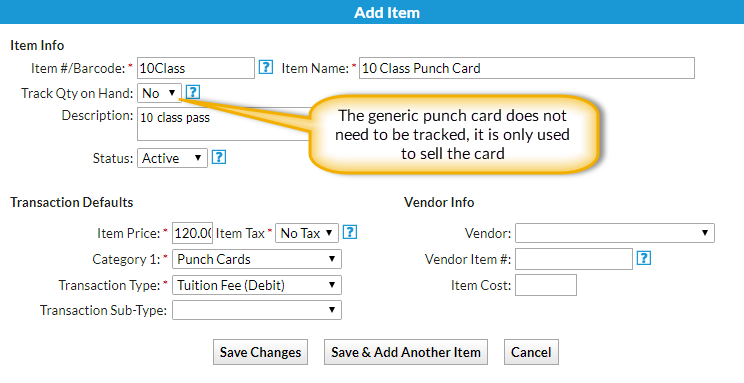 To check the remaining/unused classes for a card, go to Store > Items and you will be able to see the student's punch card item Qty on Hand. For a history of the punch card's usage you can use the Sales Detail Report (from the Store menu > Store Reports).